Front view. 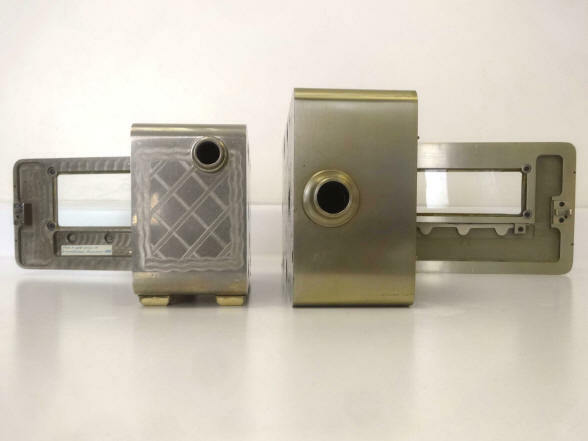 This lock was designed to present a formidable profile. 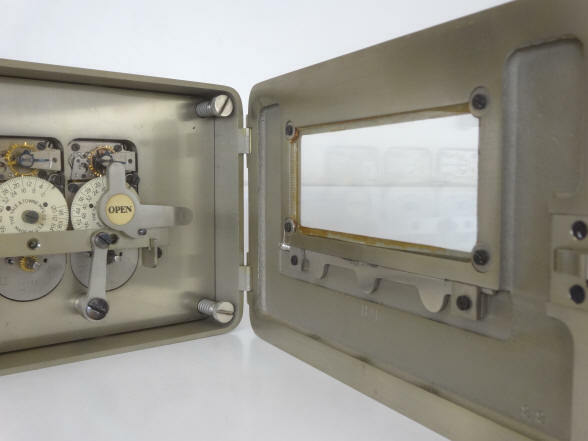 The glass aperture is much smaller as a ratio to the door than the standard Yale Triple K model giving the overall impression of impregnability. Another example of this type of case design by Mosler. Here the lock is shown with what Yale offered as an option on their locks equipped with L-movements, a "Throw Off Flag" seen in the upper right hand corner. This could be set by the operator to keep the lock off guard regardless of what the movements are set to. 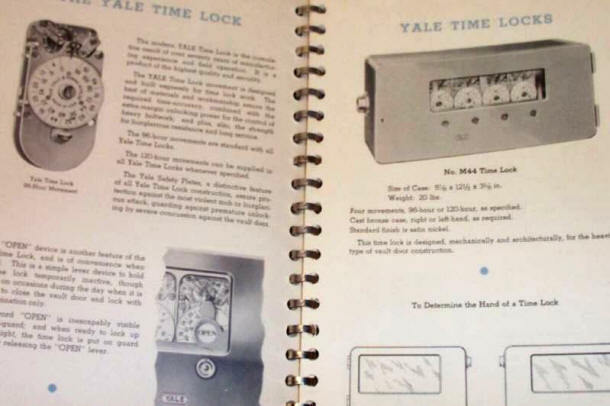 For Yale's largest locks, those equipped with M-movements, the throw off flag was standard. A close examination of the movement plates near the bottom shows a careless scribbling of maintenance personnel, posting the initials of the person as well as order of the movement positions using Roman Numerals, even though it was unnecessary by this time; Yale's time lock movement positions were completely interchangeable after around 1910. In the first photo the throw off flag is engaged, and when engaged purposefully covered the right most dial and could be seen through the door glass to warn the operator that the lock is put manually off guard. The flag is spring loaded to swing clockwise when released and stay out of the way to prevent unintentional interference. The access door on the left, second photo, when removed reveals the the bolt dog, but appears to not offer any real purpose. This area is normally never accessible from the front of the lock and is covered by the movement mounting plate and so cannot be reached without removing the entire movement set. There is nothing unusual about the bolt dog and is the same design as used in other Yale models. This access arrangement would seem to invite tampering. A feature that appears unique to this time lock model is the keyhole apertures. All other Yale models use eyelets either through the door glass which appeared in a model's early production run and then through the metal portion of the door adopted later on. Here the hole is covered by a spring-loaded shutter; a clever design that takes its cue from Mosler, where the holes are covered with a manually operated slide shutter. 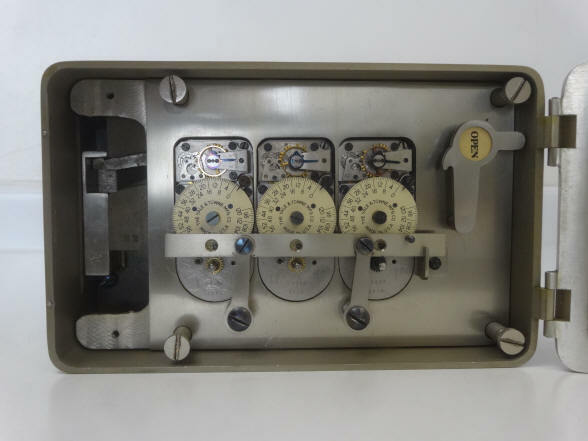 In this model the shutter operates automatically to cover the hole without the intervention of the operator. This photo shows a side-by-side comparison between the Triple K and M33. Although the movements look different, they are functionally the same L-movements and are fully interchangeable. The Triple K has older Seth Thomas supplied movements. By the time the M33 was introduced Swiss movements were used. The M33 is much larger than its counterpart and this is largely for style as confirmed by the catalog entry below. The left hand photo shows the difference of the smaller diameter boltwork holes of the Triple K and the larger for the M33. The location of the hole is also interesting. Normally the hole is at the top, "special" orders had the hole at the bottom. This is the only model seen so far with the hole in the middle of the case. 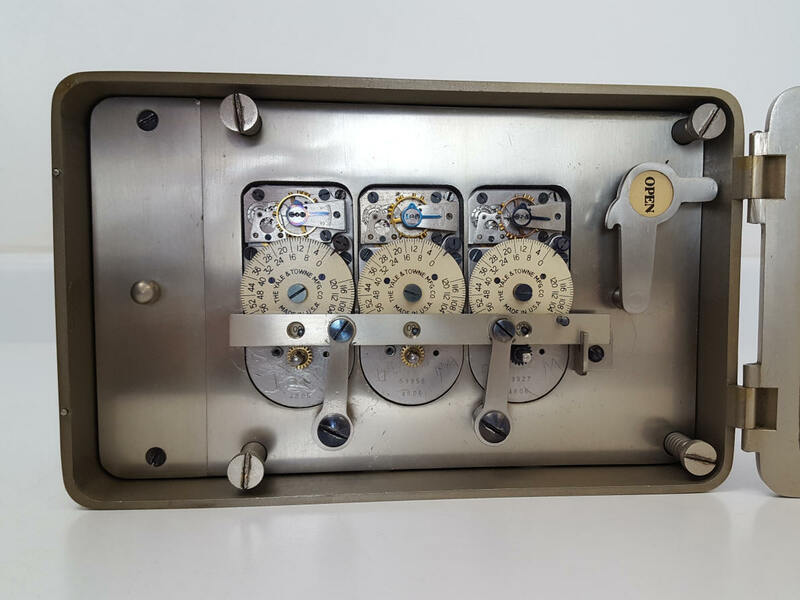 The right photo shows an illustration of a similar Yale lock equipped with four movements designated M44. 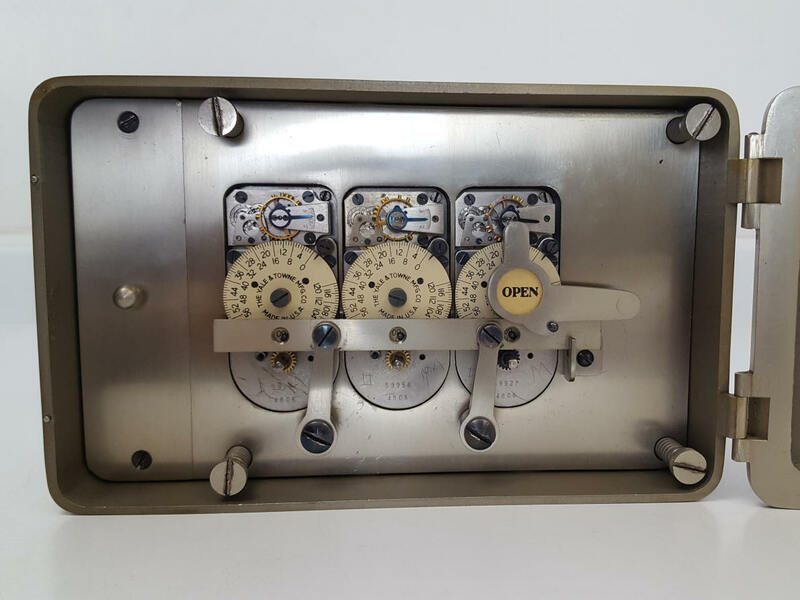 The last line describes this style as follows: "This time lock is designed mechanically and architecturally for the heaviest type of vault door construction." 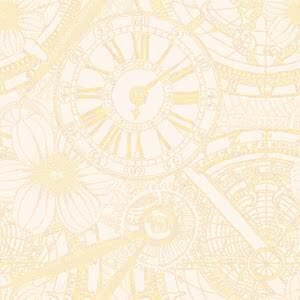 It is a confirmation of this author's observation that the lock style, case and number of movements that time lock makers offered had as much to do with marketing as it did with functionality. The comparison between the Triple K and M33 are representative of this. 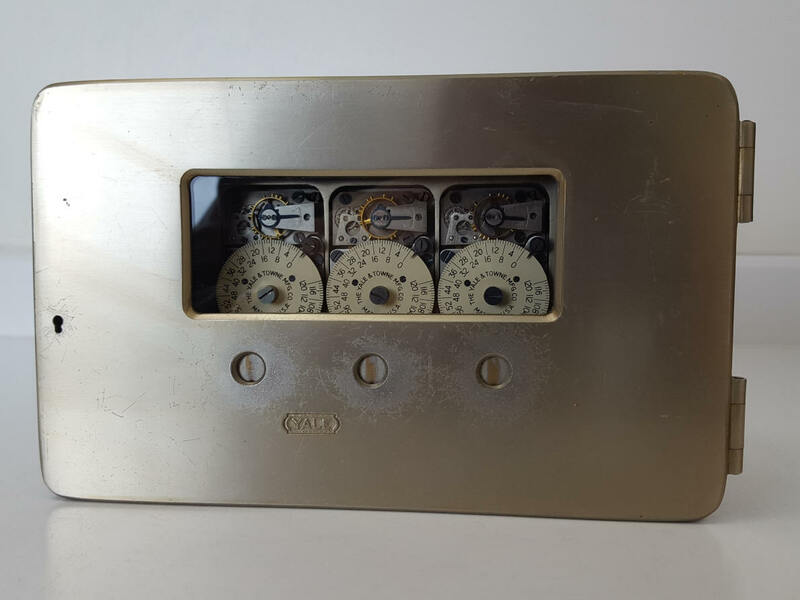 The two locks are functionally identical, using the same number and type Yale L-movements, but the M33 would look more appropriate for a larger door. Presumably it was more expensive than its counterpart and this may have contributed to its scarcity. Even though it is a not an early time lock within the scope of Yale's production history, the catalog illustration is the only example of this style of time I have seen until the appearance of the M33. The movements in the catalog look to be retrofitted Seth Thomas M-movements with the longer duration paper dial format. Yale was doing this retrofit until 1970. This lock is fitted with Swiss-made movements which were not sourced until the early 1960's.